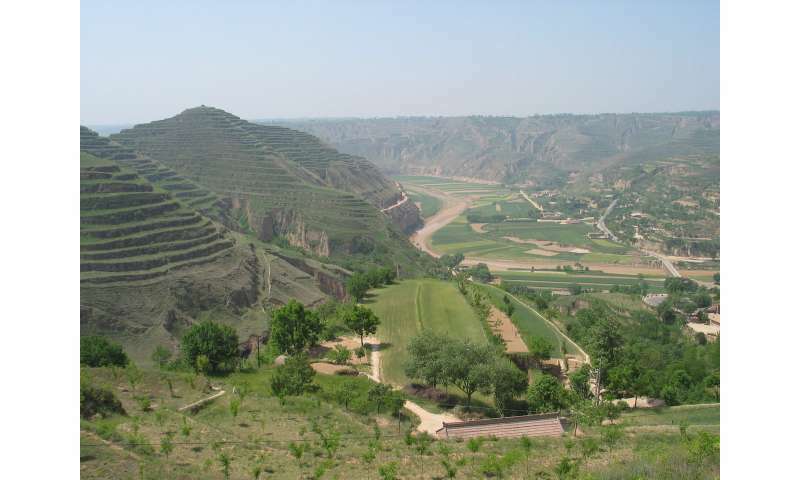 Hillsides are terraced in the Loess Plateau, Dryland Agricultural Research Station, Doupo Village, China. Credit: Xianqing Hou. Even though it is such an important crop there, potato yields are lower than they could be. The area has a dry climate with uneven precipitation. Droughts are common, especially in the spring when crops are just starting to emerge. If soil moisture was more reliable, the potato crops would do better. 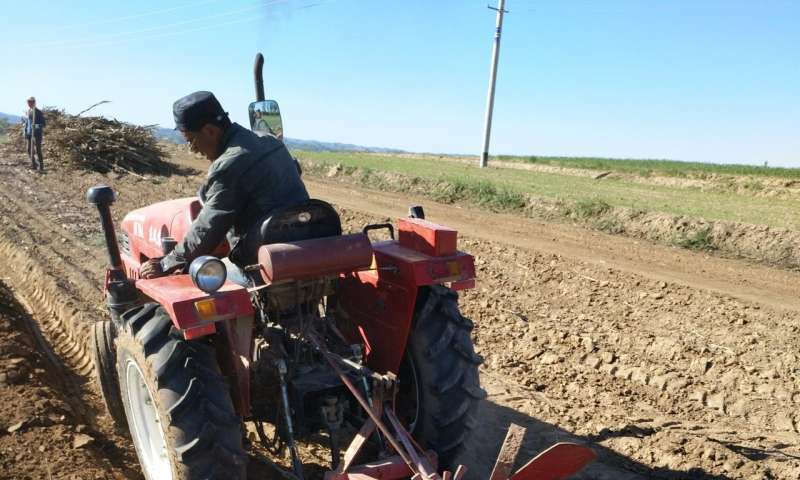 Rong Li and colleagues at Ningxia University in Yinchuan, China set out to discover if different tilling and mulching practices could improve soil moisture—and crop yields—in the Loess Plateau. The researchers studied three tillage options (conventional, no-till, and subsoiling) combined with three mulching options (no mulch, straw mulch, and plastic film). Usually, the Loess Plateau fields are plowed, or tilled, after the harvest and left bare until spring planting. This is known as conventional tillage. Conservation tillage can mean not tilling the soil at all between crops (no-till). Another conservation option is subsoiling: deeply breaking the soil with a long blade, without turning it. Tillage helps water soak into the soil and improve water storage within the soil. Li said, "We didn't know whether tillage with varied mulching practices would improve drought resistance during the potato seedling stage in these dryland farming areas." The team studied the same field over two years—a relatively dry year followed by a wet year. For each combination of soil management options, they measured topsoil temperature, soil water content, seedling emergence rate, and marketable yield of potato tubers. Plow tillage in one of the experiment plots, Dryland Agricultural Research Station, China. Credit: Xianqing Hou. Plastic mulch warmed the soil more than the other mulching options. Straw mulch had a cooling effect compared with no mulch. However, all three options produced soil temperatures in the right range for rapid potato germination. So it seemed that topsoil temperature was not the key factor for early seedling growth. Rather, the team concluded that drought was the main factor limiting crop production. Soil moisture during the seedling period is essential for crop success. Techniques that maintained soil moisture improved both the emergence rate and strong seedling establishment. Both are essential for good tuber formation and marketable yield. Seedling emergence was lowest with conventional tillage and no mulch compared to other treatments. The highest emergence rates occurred when subsoiling was combined with plastic mulch. Within the same tillage option, seedlings in mulched plots were much taller than those without mulching. Straw mulched plots had the highest potato tuber yield, followed by plastic mulch. Conservation tillage (both no-till and subsoiling) with straw mulch led to higher potato yields and marketable tuber rates compared to other treatments. The highest marketable potato tuber yield was found in the combination of subsoiling with straw mulch. This yield was 14.9% higher compared to conventional tillage with no mulch. Li and his team concluded that if the main goal is to increase soil moisture, straw mulch should be selected. Straw is also relatively low-cost and environmentally friendly, while plastic mulch can cause pollution problems and is a less sustainable method. "We recommend conservation tillage combined with straw mulch as a more favorable farming practice for drought resistance in potato seedlings," Li said. "This combination has great potential for greater crop production in our region and similar semi-arid dryland farming regions of the world." In the Loess Plateau, where the potato is king, these findings may prove to be truly royal.